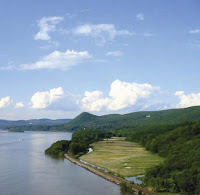 Tomorrow, Wednesday, June 12th, 2013 the Hudson River Valley Greenway meeting will feature presentations from various New York State Agencies on upcoming grant and funding opportunities available through New York State. The New York State Office of Parks, Recreation & Historic Preservation has announced that it is seeking business or community service proposals to provide outdoor recreation and instruction programs that encourage state park visitors to participate in healthy activities. The information gathered will be examined to identify opportunities to expand outdoor recreational programming and instructional classes, introduce park patrons to new recreation opportunities and new outdoor skills, and increase visitation in the parks and historic sites of the state park system. The Request for Expressions of Interest (RFEI) targets businesses, non-profit organizations and individuals, potential operators, user groups, and other prospective partners for ideas for outdoor recreation programs and activities at the parks or sites of their choice. After receiving responses, State Parks will assess the submissions and may elect to interview those received which meet the agency’s goals and objectives with potential benefits and impacts on the park system overall, as well as the park under consideration. State Parks intends that the RFEI will help in the development of one or more programs for the enhancement, improvement and future use of the parks. Attention: Harold H. Hagemann, Jr.
Clearly marked responses may also be electronically submitted on or before the deadline to the following e-mail address: concessions@parks.ny.gov, or via a CD mailed to Mr. Hagemann as noted above. New York State Office of Parks, Recreation and Historic Preservation oversees 178 state parks and 35 historic sites. For more information on any of these recreation areas, call 518-474-0456 or visit www.nysparks.com, connect on Facebook, or follow on Twitter. The New York Council for the Humanities has awarded $82,000 in its first round of Directors’ Project Grants for exemplary dialogue-based humanities programs to nine organizations ranging from a theater company in New York City to an African-American cultural center in Rochester. Abolition&#8211Two Worlds on Staten Island, a community dialogue and exhibition exploring the contested history of the Underground Railroad on Staten Island. The Baobab Film and Dialogue Series 2012-13 a year-long series of community dialogues in Rochester, many of them using films as a catalyst for discussion. The Battle of Queenstown Heights Commemoration in Lewiston, which includes 18 dialogue stations to help mark the first major battle of the War of 1812. Epic Theatre Ensemble’s Spotlight on Human Rights Festival at the John Jay College for Criminal Justice in New York City. Frederick Douglass in Ireland: The Irish Influence on America’s Greatest Abolitionist, a day-long program of public discussions at St. John Fisher College in Rochester. RACE: Are We So Different? A series of radio programs and a public forum in Rochester in conjunction with an exhibition about the historical, cultural, and scientific understandings of race. The Counterculturalists: Towards a New Canon, a series of online interviews, discussions and a culminating symposium exploring new understandings cultural identity offered by the Asian-American Writers Workshop. The D.R.E.A.M. Freedom Revival, four events in Syracuse that use performance and dialogue to engage participants about a range of issues from participatory democracy to aging. The Guantanamo Public Memory Project, which will use discussions and mobile phone engagement to help New Yorkers understand the role and legacy of Guantanamo. “These innovative projects show how the humanities can be central to promoting community engagement and civil discourse across our state,” says Council Executive Director Sara Ogger. Directors’ Project Grants are available to any tax-exempt organization in New York State. Applicants should be prepared to demonstrate the exemplary nature of their project, and explain how it uses dialogue to spark public engagement. The next deadline for application is December 15, 2012 with notification 12 weeks later. More information about the grant guidelines and application forms can be found online at www.nyhumanities.org/grants. In 2011, the Council awarded almost half a million dollars to public humanities projects, mostly in the form of small grants of up to $3000. To learn about the Council’s other grant opportunities, including its Special Initiative War of 1812 Project Grants, visit www.nyhumanities.org/grants. The Council’s grant program is supported by the National Endowment for the Humanities and the Legislature of New York State. Any views, findings, conclusions or recommendations expressed in the funded programs do not necessarily represent those of the National Endowment for the Humanities. Founded in 1975 and supported by Federal, State, and private sources, the New York Council for the Humanities helps all New Yorkers become thoughtful participants in our communities by promoting critical inquiry, cultural understanding, and civic engagement. The Erie Canalway National Heritage Corridor recently received an $8,000 grant from the National Park Foundation that will enable 1,472 students from 27 schools in eight school districts across New York State to participate in educational field trips along the Erie Canal this fall. &#8220We have tremendous canal historic sites from Buffalo to Albany, but the cost of bringing students to them has become prohibitive for many districts. This grant removes that barrier so that students can experience firsthand the innovation and impact of the Erie Canal,&#8221 said Beth Sciumeca, Executive Director of the Erie Canalway National Heritage Corridor. In addition to Ticket To Ride funding, Erie Canalway National Heritage Corridor secured an additional $5,000 from the New York State Council on the Arts (NYSCA) to enhance the field trip program. These funds are being used to enlist the assistance of the Albany Institute of History & Art, which is developing a web-based curriculum guide and conducting teacher training and post-visit evaluations. The Erie Canalway National Heritage Corridor is one of 35 national parks and heritage areas to receive a grant from the National Park Foundation, the national charitable partner of America’s National Parks. With support from Disney, the Ticket To Ride program provides financial resources for transportation and in-park educational programming that make field trips to national parks and heritage areas possible for schools across the country. Looking for funding? This competitive grant program makes awards ranging from $2,000 to $7,000 and is aimed at funding projects that serve to advance the goals and strategies of the Erie Canalway Preservation and Management Plan. Proposals related to historic preservation, conservation, recreation, interpretation, tourism, and community development will be considered. Eligible organizations and requested projects must be based within Corridor boundaries and include nonprofits, municipalities, and federally recognized Native American tribes. The application deadline is Friday, October 12, 2012. A full grant description and application can be found online: www.eriecanalway.org/get-involved_grants-fund.htm. Awards will be announced in January 2013. The program is administered by the Erie Canalway Heritage Fund, in partnership with the Erie Canalway National Heritage Corridor Commission. For more information contact: Andy Kitzmann, Project Manager, 518-237-7000, ext. 201. New York State battlefield will benefit from some of the more than $1.3 million in National Park Service grants recently awarded to help preserve, protect, document, and interpret America’s significant battlefield lands. The funding from the National Park Service’s American Battlefield Protection Program (ABPP) will support 27 projects at more than 75 battlefields nationwide. The Park Service also announced the award of an additional $1.3 million in grants to help with land acquisition at four Civil War battlefields. Grant projects include fee simple purchases at Averasborough, North Carolina ($103,380)- Bentonville, North Carolina ($60, 380)- Cool Springs, Virginia ($800,000) and Ware Bottom Church, Virginia ($367,263). The grant funds were made available under the Consolidated Appropriations Act of 2012 (Public Law 112-74), which appropriated $8,985,600 for the Civil War battlefield land acquisition grants program. to developing an archeological research design for each of the battlefields. support of a future National Register nomination. campaign battles, that of Fish Creek, and wishes to do this with a number of interpretive kiosks. interpretive trails in the area. For a full list of the grantees, click here. The National Park Service has announced the award of two American Battlefield Preservation Program grants totaling over $100,000 to Saratoga P.L.A.N. and National Heritage Trust, for projects in the Schuylerville area. Both organizations are members of the Hudson-Hoosick Partnership and will partner with Saratoga National Historical Park in these projects. Saratoga PLAN was awarded $21,425 for planning and designing interpretive signs for the Fish Creek Trail, a one-mile trail along the south side of Fish Creek that is part of a six-mile historic loop linking Schuyler House with Victory Woods, the Saratoga Monument and the 71-mile Champlain Canalway Trail slated for completion in 2013. &#8220With the funds, we intend to hire an artist to help us tell the stories of Fish Creek,&#8221 said Maria Trabka, Executive Director of Saratoga P.L.A.N., a conservation organization serving Saratoga County. 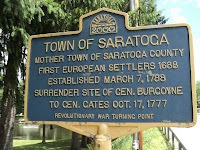 &#8220The site has a long history for fishing, travel, hydropower, and as an American stronghold during the Revolutionary War, when the British were forced to surrender.”Natural Heritage Trust was awarded $80,000 for a study of two colonial era battlefields at Saratoga (present day Schuylerville). As European and Native nations vied for dominance in North America a series of wars were fought between Great Britain, France and their Native allies. During these wars in the 1690s and again in the 1740s a number of battles were fought at Saratoga. This research will shed new light on the significant formative history of Canada and America and the important role of the Schuyler family. non-profit and governmental entities emphasizing both agricultural and open space protection, economic and tourism development, and the protection and interpretation of the region’s natural and cultural heritage.Photo: Town of Saratoga Historical Marker, Schuylerville. Photo by Bill Coughlin, courtesy the Historical Marker Database. Applications are now available for the 2012 Greenway Conservancy Small Grant Program from the The Hudson River Valley Greenway. A total of $50,000 is available for matching grants in this year’s program.The Greenway Conservancy Small Grant Program is an annual competitive grant funding opportunity available to communities and not-for-profit organizations within the designated Hudson River Valley Greenway area, which extends from Saratoga and Washington counties to Battery Park, Manhattan. The program offers funding for trail planning and design, construction and rehabilitation, and education and interpretation. Emphasis is placed on trail projects that seek to implement the goals of the Greenway Trail Vision Plan, fill in identified gaps in the Greenway Trail System, and make improvements to designated Greenway Trails. Copies of the Hudson River Valley Greenway Trail Vision Plan may be downloaded online. This annual program has offered technical and financial assistance to municipalities and not-for-profit organizations since 1995. · Education and Interpretation projects, including trail signs, kiosks, guides, maps, brochures, one-day conferences or workshop series. · Projects to construct, design or plan trail segments or trail links that further the goals of the Greenway Trail Program. · Rehabilitation projects to improve trails/trail segments that further the goals of the Greenway Trail Program. Applications can be requested by calling (518) 473-3835, by emailing the Greenway at hrvg@hudsongreenway.ny.gov, or by download from the Greenway website. All applications must be postmarked by 5:00 pm, August 17, 2012. Late, incomplete, faxed or emailed applications will not be accepted. The City of Geneva and the Finger Lakes Boating Museum have announced that grant agreements totaling $2,450,000 in state funds for the development of the Boating Museum and Visitor Center have been received and are being executed. The funds will be used for the design and construction of a museum showcasing boating and boat building in the Finger Lakes region, as well as an enhanced visitor center. The project will be developed on the north shore of Seneca Lake on the site of the existing visitor center. The State of New York announced two separate grant awards, the first a $2,000,000 grant from the Dormitory Authority of the State of New York, secured through the efforts of State Sen. Michael Nozzolio. The second grant of $450,000 from New York’s Local Waterfront Revitalization Program was announced as part of the 2011 Consolidated Funding Application process. The City has selected Pittsford-based Hanlon Architects for design and engineering, which will begin immediately, and Chrisanntha Construction for construction of the project, which is slated to begin this fall. Interested persons can see some of the Museum’s collection of boats on display at the 2012 Boating Festival in the Geneva Lakeshore Park Saturday (10-5) and Sunday (10-4), July 14 and 15. The Show will be held the same days as the Musselman Triathlon 2012 races and events. The boat show will be from 10 a.m. to 5 p.m. on Saturday, July 14, and from 10 a.m. to 4 p.m. on Sunday, July 15. Admission is free. Many of the Museum’s wooden rowboats, power boats, and canoes built in the Finger Lakes will be on display. Activities will include workshops and demonstrations on boat building and restoration, interactive nautical displays and a sailing regatta. For more information, check the Boating Museum’s website at www.flbm.org. 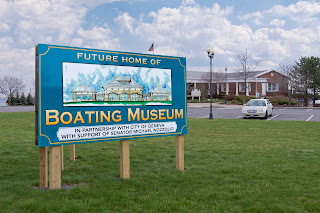 The Boating Museum reached agreement with the City of Geneva in the fall of 2009 to establish a permanent home on the Geneva waterfront in association with a Visitor Center. The Boating Museum has assembled a collection of more than 115 wooden boats built in the Finger Lakes over the past 100 years, as well as numerous related artifacts and extensive reference material. Portions of the collection will be displayed on a rotating basis within the new facility, but President Scalise emphasized that there will be a lot more to the museum than viewing boats because education, restoration and preservation are the key elements of the museum’s mission. Also featured will be boat rides on Seneca Lake, active on-water programs including sailing and small boat handling, interactive workshops and displays to engage visitors in the design and construction of boats and boating history materials and programs. Photo: Construction of the Finger Lakes Boating Museum and Visitor Center will begin this fall on the north shore of Seneca Lake in Geneva. Forty historic New York places representing all five boroughs have been named finalists competing for $3 million in grants through Partners in Preservation, a collaboration between American Express and the National Trust for Historic Preservation. The preservation effort powered by social media will allow the public to vote online through May 21, 2012 for the preservation projects most important to them at www.PartnersinPreservation.com. Participants can vote once a day, every day, for the same site or for different sites. The top four vote-getters, to be announced May 22, are guaranteed to receive grants for their preservation projects. A Partners in Preservation advisory committee of community and preservation leaders, will select sites that will receive the rest of the $3 million in grants. To encourage voting, a “Preservation Station” vehicle will travel around New York City throughout the voting period, giving New Yorkers the opportunity to get their photos taken against the backdrop of their favorite sites and have those pictures projected onto buildings. To find out where the “Preservation Station” will be, follow @PartnersinPres and @AmericanExpress on Twitter.